The KM Standards are coming: Is this a big deal? For the past couple of years, national standards committees have been working on the development of an ISO Standard for Knowledge Management Systems. Is this a big deal? How have we got here? Will it have an impact? Who is likely to benefit? What does it cover? We would like to stress from the start that the new ISO BSI Knowledge Management Systems Standard is a standard of principles. We believe, contrary to some in the Knowledge & Information Management (KIM) community, that there is real value in having a set of universally-agreed principles that practitioners can align with. The new standard sets down a marker for future knowledge managers to benchmark activities against. As with all BSI standards, it will be reviewed every five years to ensure that it is up to date. The idea of KM Standards is not new; the British Standards Institution (BSI) first discussed it in 2000. BSI’s initial look at Knowledge Management standardization in 2000 resulted in a publication: Knowledge Management PAS 2001: a guide to good practice. Interestingly it presented this figure to illustrate the above conclusion. BSI noted: “…within British Standards there are effectively three levels of standardization that can be applied according to the requirements of the industry at that specific point in time. So what has changed? Why is the time right for a standard? Despite frequent predictions of its demise, the discipline of KM (or whatever guise it appears in) is now a tactical/operational role in many organisations. Take a glance at the countless adverts for knowledge managers to see what we mean. KM has grown in maturity, and can now be considered to be almost a quarter of a century old, so meets the criteria BSI applied for having a standard. Today we await formal publication of ISO KM Systems Standard 30401, individually approved by the national standards committees and the ISO Working Group that oversaw its development. Indeed it may well have “hit the stands” by the time you read this. What we can confidently predict is that on 8 October there will be a formal launch event organised by BSI details of which will be available soon. Work started in 2015 and was conducted by an ISO steering committee supported by eight national mirror committees including the UK, which contributed significantly to the initial draft. A draft was made available for public review for a six-week period during December 2017 and January 2018. Hundreds of comments were received and the UK BSI committee went through each one (including those of CILIP’s K&IM SIG), identifying 270 suggestions to be referred back to the ISO committee. These were combined with comments from 15 constituent countries, including eight national mirror bodies. This means that the final standard not only reflects UK contributions but those of other countries. The new KM Standard will not try to tell you how to do KM, but it does help you ensure you have set up a good management system, providing a solid foundation on which to build your KM solution. The standard is flexible. It is applicable to large and small organisations. It sets out principles for guidance. This standard does not mandate how you implement KM. It describes requirements for the final product but not how you get there. It’s an attempt to ensure that KM is managed with a degree of consistency. It is an aid for self-audit. It starts with an outline of the purpose of the standard. It outlines why KM is important. It provides Guiding Principles and outlines the boundaries of KM. There are three annexes on: the knowledge spectrum; boundaries between KM and adjacent disciplines; and KM culture. It provides a benchmark for your KM management system and a guide to those organisations that are new to KM to help them avoid common pitfalls. It gives knowledge managers leverage in their organisations. It gives KM legitimacy as a profession. 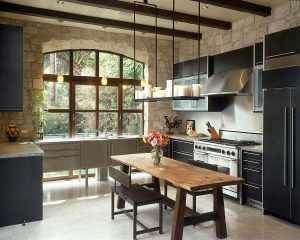 The standard is like a new kitchen without the utensils, the crockery, cookbook; it’s down to those who use it to determine how it will work for them. At first, practitioners are unlikely to see a significant change. Few assessors have seen the standard, even fewer will have a KM background, though it’s arguable whether that is a prerequisite to undertake a “compliance audit”. Our hope is that it provides a globally-accepted framework of what should be in a KM programme and how it should be supported and assessed. We are looking forward to it being drawn on by organisations that value KM. Undoubtedly consultants will develop offerings that purport to help organisations to prepare for an ISO KM Standards Audit. If that helps to raise standards then surely that’s a positive. However, we see the real beneficiary being KM practitioners, current and future in those organisations such as the public sector for which ISO Standards are a core component of their quality measurements. 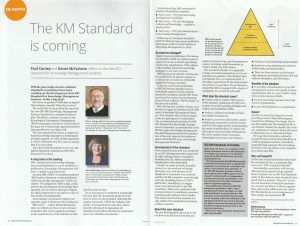 Excellent article in CILIP magazine by Paul Corney and Karen McFarlane CMG describing the forthcoming KM Standard. 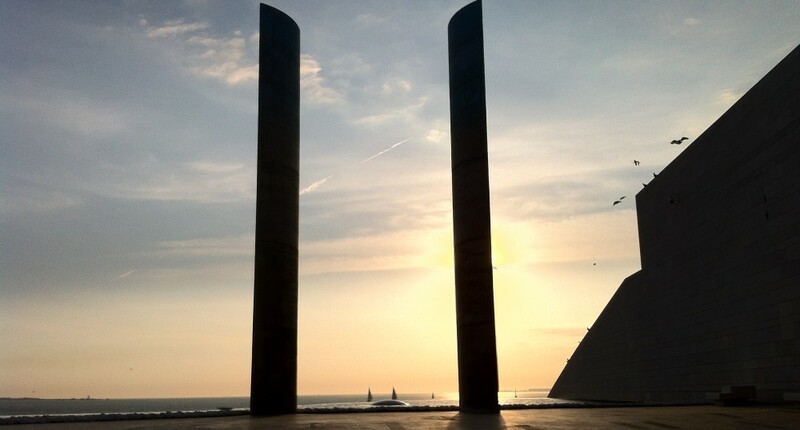 Despite one or two early reservations (and a lot of commenting) – I’m convinced that – used thoughtfully and strategically – it will become an exciting force for good. Hungry for more? Watch this space for news of an exciting collaboration! In the intervening period the post has been viewed by more than 4k people and liked by 100+. It also spawned a number of comments from those in the KM Community who oppose the idea of standards for KM. While everyone is entitled to their opinion and I’ve expressed mine in the article I was very disappointed that once again the integrity of those who took part in the process was called into question. I participated because I believed it was the right thing to do not because I thought it would generate future business. Anyone who knows me and the pro bono / community work I’ve done and will continue to do will confirm that is not how I am wired! This entry was posted in Business Issues (Strategic), ISO KM Standards and tagged BSI, chris collison, Cilip, Information Professional, ISO KM Standards, Karen McFarlane, Knowledge & Information Managment Ambassador by Paul Corney. Bookmark the permalink.